What are the best things to do in San Francisco? There are so many that it might be hard to choose. One very popular attraction is the Golden Gate Bridge. Every year, millions of people walk the length of the bridge from the Presidio to Marin. Not only is it a beautiful sightseeing experience, but it's also great exercise! Click any slide's "More Details" button to learn more! Fort Point is a Civil War fort at the south end of the Golden Gate Bridge that played a big role in the building of the Golden Gate Bridge and in World War II. The Fort Point National Historic Site is open several days each week and there is no cost to visit. Fort Funston is a wonderful place to picnic. Enjoy lunch or a walk while hang gliders soar overhead, or take a dip in the cold surf. There is an off-leash dog area, as well as the Fort Funston Native Plant Nursery. Did you know that Golden Gate Park houses a herd of bison? Meander through the park and discover all of the hidden wildlife - definitely one of the best things to do in San Francisco. Golden Gate Park's Conservatory of Flowers houses many rare plants and flowers. It's always warm and lush inside, even in the dead of winter. In cold weather, this is one of the best things to do in San Francisco. The San Francisco Zoo has many animal exhibits, but perhaps the most fun is feeding time in the penguin area. Watch them clamor for fish and swim through the penguin pond - and enjoy all of the other attractions at this world-famous zoo! Union Square is a shop-a-holic's dream. With blocks and blocks of shops and stores -including Macy's- there's no way you'll leave San Francisco empty handed or wanting for goodies. Union Square isn't the only place to enjoy great shopping and food. Chinatown is always bustling, at any time of day or night, and there's plenty to see, do and buy! When you stroll through Chinatown, be sure to stop by the fortune cookie factory. You'll have an opportunity to see how fortune cookies are made as well as to try a few samples. Discover the unique history and grandeur of San Francisco's Asian Museum. Admission is free on the first Sunday of the month and special events and exhibits are held frequently. 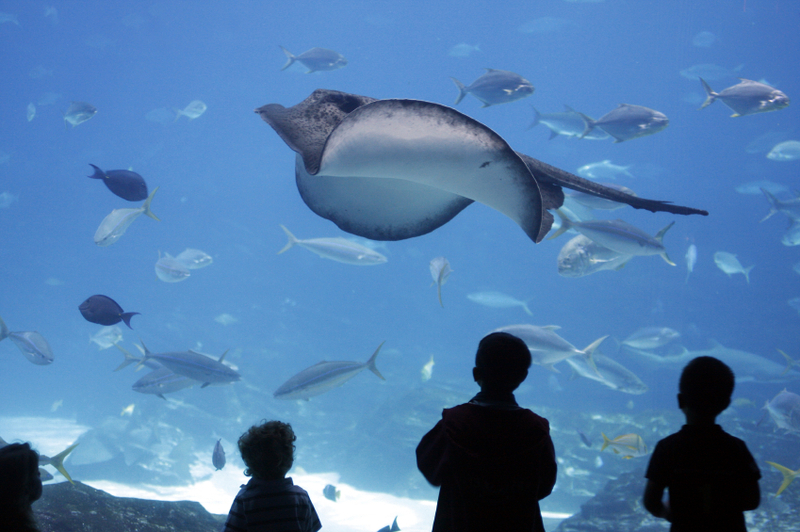 The California Academy of Science's Steinhart Aquarium is fun for all ages. The modern facility is sure to captivate visitors of all ages, kids and adults alike. San Francisco has water on three sides, so there is a lot of shoreline to explore. Let the sea air refresh you while listening to the sound of crashing waves. The San Francisco Bay Area has some of California's best surfing areas, including Ocean Beach (pictured here). If you've never surfed before, never fear - you can arrange for lessons and a board rental relatively inexpensively. If you love the water, you won't want to miss surfing alongside seal lions and whales. The Palace of Fine Arts is a great place to picnic and view the gorgeous coastal views. Inside the Palace is the Exploratorium, a special hands-on science museum where you can play with the exhibits. Spend a leisurely morning enjoying the sights, sounds and tastes of this Italian-heritage community. Positioned between Fisherman's Wharf and Union Square, strolling through North Beach is one of the most popular walking tour spots in San Francisco. Riding the cable cars can be a lot of fun, but that's not the only way to enjoy them. Spend some time in the Cable Car Barn & Powerhouse, the nighttime home of the cable cars. You can see the cables in motion and marvel at the displays of antique cable cars. Anchor brewing offers two free public tours each weekday. Watch the brewing and enjoy the free samples of San Francisco's hometown beer. Tours are free, but reservations are required. San Francisco has countless night clubs and bars, so if dancing is your thing, you're in luck. No matter what type of music you like, you'll find a club to suit your tastes. From 11015 Folsom to The End Up - and many other options - there are plenty of places to enjoy cocktails and live music during the evening hours. Enjoy the end of your day relaxing at one of San Francisco's many great waterfront or romantic restaurants, watching the sun set in the west over the city's impressive skyline.